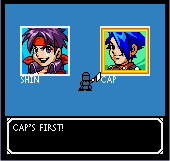 REVIEW: Card Fighters' Clash is a "collect-em all" style card game made by SNK in 1999 for the Neo Geo Pocket. 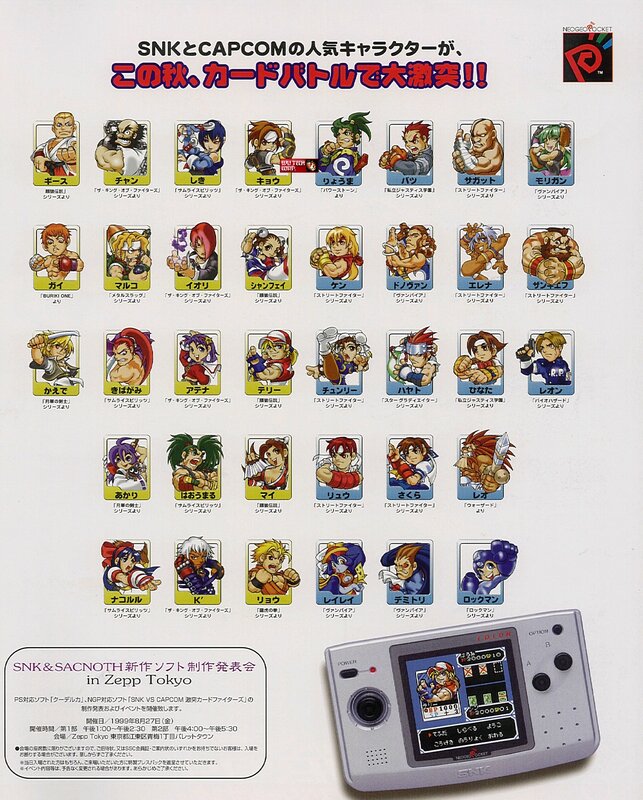 The game features hundreds of Capcom and SNK personas as cards (over 300 in all) from an impressive variety of franchises. 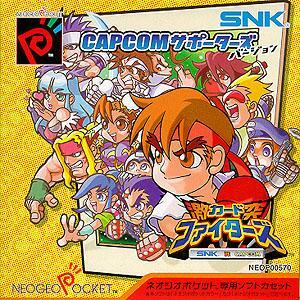 There were two versions of the game made, a "Capcom" version and an "SNK" version. 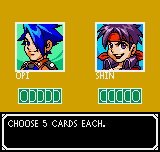 Both versions are identical, accept that you start with different cards and selectable characters. There are also a few "special" cards that are exclusive to each version. 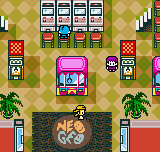 The object of the game is to challenge other players as you roam around the different landmarks based on Capcom & SNK. Upon winning, you collect new cards to strengthen your deck. 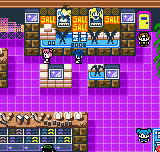 You can enter shops to buy new cards, or gain new cards by defeating other card fighters. Most cards have unique abilities, and it's up to the player to strategize and decide which cards to put in their deck. Players can create and save up to 3 custom decks. This actually comes in handy, since there are a huge variety of different angles and strategies available in the game. It all depends on what cards you use, and more specifically how you set up your deck of 50 cards, balanced with "Character" and "Action" cards. 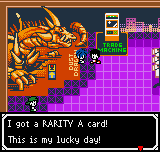 The cards are drawn at random each fight, so there's also a little bit of chance involved. 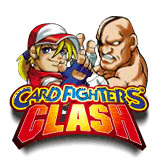 In my opinion, Card Fighters is actually more strategic than the likes of Poker, Blackjack, or nearly any popular casino/card game you could think of. Playing against an equally skilled human opponent is incredibly fun once you learn the ropes. Be sure not to kurf yourself. If you've never played Card Fighters or have no idea how it's played, here's a quick crash course. In your deck of 50 cards, you want to balance out "character" cards and "action" cards... too many action cards and you may find yourself short on character cards to put on the table (which are used to attack your opponent and also defend against their attacks). If you put too many character cards in your deck, your playing style may end up being too stiff & slow, leaving you open for your opponent to take advantage with their dynamic action cards. 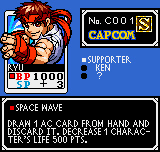 Character cards give out a certain amount of "SP" when they're placed on the table, and "SP" is needed to use action cards. Got it? Good. 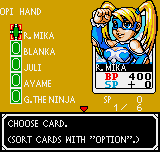 The stronger of the character cards have unique "abilities" that mix up the game. "Triangle" based cards have abilities that are used as soon as the card is placed down on the playing table. "Circle" based cards have a constant effect once placed down, and "Square" based cards' abilities can be used the turn after the card was placed down, activated by the player. Once again, you use your character cards on the board to defend against oncoming attacks from your opponent, and if you can't defend, you'll get hit, causing a loss of HP in respect to the character card's HP. Lose all your HP and it's GAME OVER! You can also lose by running out of cards from your pile of 50 cards (if it ends up being a long game). On that note, certain action and character cards can actually force your opponent to "discard" some of their cards so they run out of cards faster (yet another possible attack strategy). 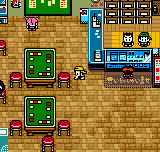 With so different ways to win a card battle, it takes quite a long time to fully understand and master Card Fighters. In fact, since the in-game translation of some of the character abilities are so bad, you actually have to try them out in the game and experiment to see what they do (unless you use an online guide). However, figuring out the strengths and weaknesses of various cards is an entertaining game in itself. And at the end of the day, the game ends up being surprisingly balanced. The 1-player experience is actually pretty solid with memorable locations, soundtracks, and charmingly funny characters you'll meet. My only complaint is that the computer AI during card battles is usually pretty dumb and very easy to beat even with an "average" deck. Obviously, the 2-player game is where it's at, and when two knowledgeable human players go at it, you might find yourself playing this game for a very, very long time. My close friends and I are going on "15+ years" playing this game... no joke. CFC's gameplay is awesome and as I said before, quite balanced... but there is actually one "infinite" in this game that some may consider game-breaking. However, it's considerably hard to do and requires you to take quite a lot of risk too. Basically, if it's done correctly, your opponent has to "discard" all the cards in their deck. It's definitely the cheapest "move" in the game, and is probably the game's only real flaw. It's not a big deal, since you and your friends can decide to ban that move if you prefer (if you even know about it, that is). 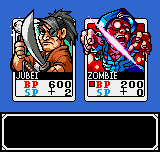 Besides that, Card Fighters is incredibly fun, challenging, and offers some of the deepest strategic gameplay I've ever experienced in a card game. On the same token, it's not "over-complicated" like some other card games out there. The in-game graphics are done very well, considering the technology available at the time. The clever and catchy art style really defines the visuals of Card Fighters. 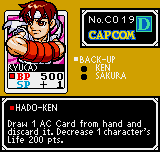 Capcom & SNK character cards ooze with personality, and all your favorite Capcom & SNK icons are immediately recognizable.. even with their super-deformed, and eerily large heads. 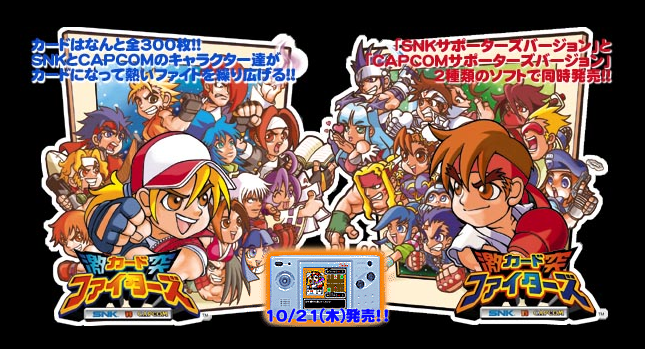 Also, to see so many characters in one game adds a countless amount of nostalgia to us Capcom & SNK enthusiasts (especially for back then). 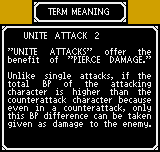 When the cards "clash" during attacks, the character-specific hit effects & sound effects enhance the action... effectively adding in that "ouch" factor we know and love in fighting games (well, you have to use your imagination a little bit). lol. 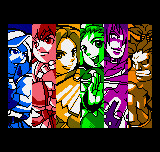 The actual human characters within the Card Fighters world are made up of maybe 15 pixels at the most, but any old school gamer will find a certain charm and personality to love about the characters. 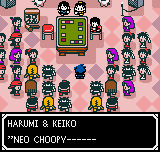 There's a ton of hilarious dialogue to scroll through, and "random" characters scattered throughout to talk to. Also worth mentioning, the poor translation and misspellings of random words makes it all the more entertaining! 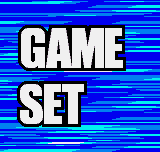 If you like RPGs or card games and you're a fighting game buff, you simply can't miss this game. 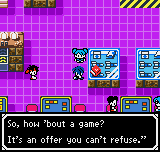 Final Words: "But Frank... Card Fighters isn't even a fighting game! Why does it have a TFG profile?!?" ..... I thought you'd never ask. Card Fighters is "TFG-worthy" simply due to its countless fighting game references, character cameos, unforgettable artwork, and because it's a very underrated game that more people should know about (and try). Ohh yeah... it's also the first ever "SNK VS Capcom" crossover game ever made. Yeah, that's kind of a big deal, too. 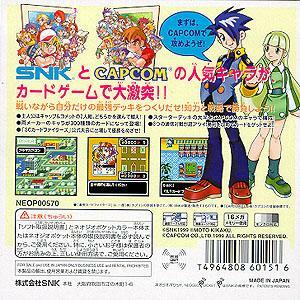 While it's not for everybody, I'd recommend Card Fighters to anyone who calls themselves a true Capcom or SNK fan, and to any fan of card games in general. Don't let the cutesy look fool you, there's an "adult" card game present here, and after playing this game on and off for over a decade with my best friends, it's STILL FUN... and a "one-of-a-kind" gameplay experience that I always love coming back to. To truly understand how good of a game it is, you have to play the game with another human opponent who is also confident in their deck and skills. 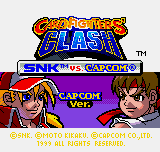 It really comes down to this... do you have friends that own a Neo Geo Pocket and do they know how to play Card Fighters Clash? If the answer is yes, you know this game is practically timeless. 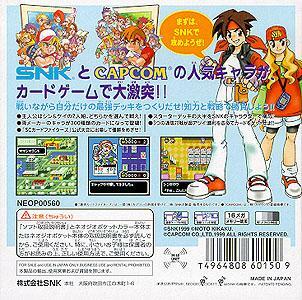 CFC was definitely one of the best games to come out for the Neo Geo Pocket, if not the best game next to Match of the Millennium.